I spent most of June in the Philippines visiting my family. It was pretty special — I traveled to new cities, ate way too much, and saw family members I hadn’t seen in decades. 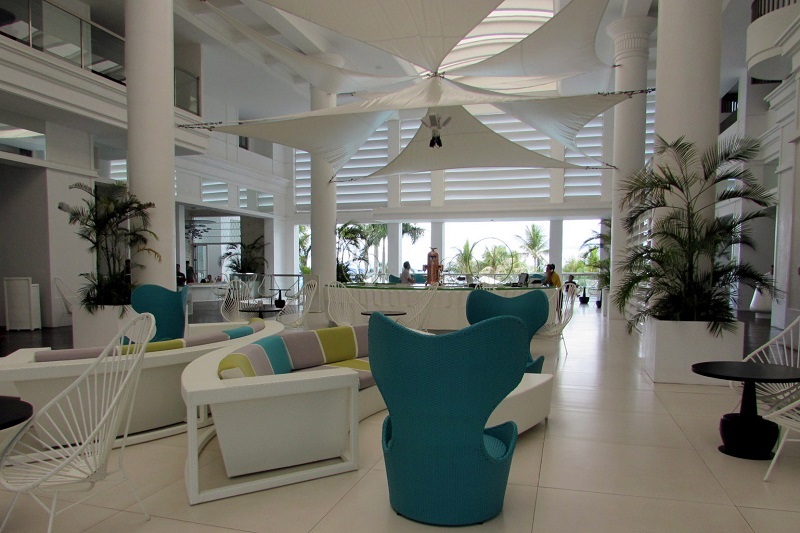 During my trip to Cebu, I was completely spoiled with an overnight stay at Mövenpick Hotel on Mactan Island. A beautiful beachfront hotel, this Swiss hotel has created a fresh, contemporary, stylish retreat. As we checked into our room, I noticed that the hotel spa offered a 30% discount on any services booked between 10am and 3pm. Hmm, I think that’s worth a look. I took a break from beach lounging with my cousin to walk over to the spa and check out the menu. The friendly receptionist at Spa Delmar walked me through the menu. I explained that I definitely wanted a massage, but I also like body scrubs. 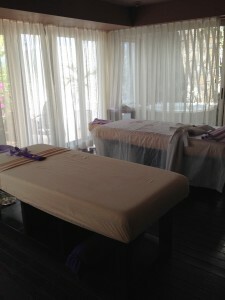 She sold me on the Vitality Package — a two-hour treatment that includes a body scrub and massage for P4,500. After the discount, that equates to about $72. Sign me up! I love the Philippines! The next morning, my cousin and I enjoyed a yummy breakfast buffet at the hotel. (Having now traveled to Vietnam and the Philippines, I can confirm that continental breakfasts included at U.S. hotels ain’t got nothing on Asian hotel breakfasts!) I walked over to the spa, excited for my 10am appointment. After filling out my intake forms, I was instructed to choose one of three fragrance options. I went with “romantic”. My massage therapist Jenalyn walked me outside to my private therapy room. The word “INDULGENCE” was on the door — a great start to the session. Without a doubt, this was the most spacious treatment room I’ve ever been in at any spa. There were two massage tables set — one for the body scrub, one for the massage, a private bathroom, a private shower, then a private patio outside with a jacuzzi and rainshower. More on that later. Thirty minutes later, Jenalyn instructed me to hop out of the jacuzzi and shower. 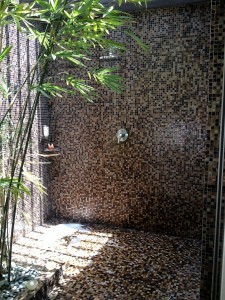 I stood outside in the beautifully glass-tiled rainshower and rinsed off. Time to go back inside for the final course the massage. As fabulous as everything had been leading up, the massage was definitely the big-finish dessert of my delicious spa meal. With massage oil, Jenalyn used acupressure on my numerous knots. More often than knot (pun intended), that type of body work hurts me, but she was able to do it in a not painful way. Before proceeding to the facial and scalp massage, she washed her hands, which I appreciated. The intake form asked if it was okay for my therapist to use oil on my face, and I had checked “no”. Upon completion of the massage, Jenalyn used a hot towel to wipe off the massage oil so I wouldn’t be a big slippery mess. Finally, since your body can be a bit sluggish after laying on a massage table for an hour, she did a few exercises to wake my muscles and joints up before I sat up. When I met up with my cousins afterward, I must have looked like the most relaxed, happiest woman in the world. 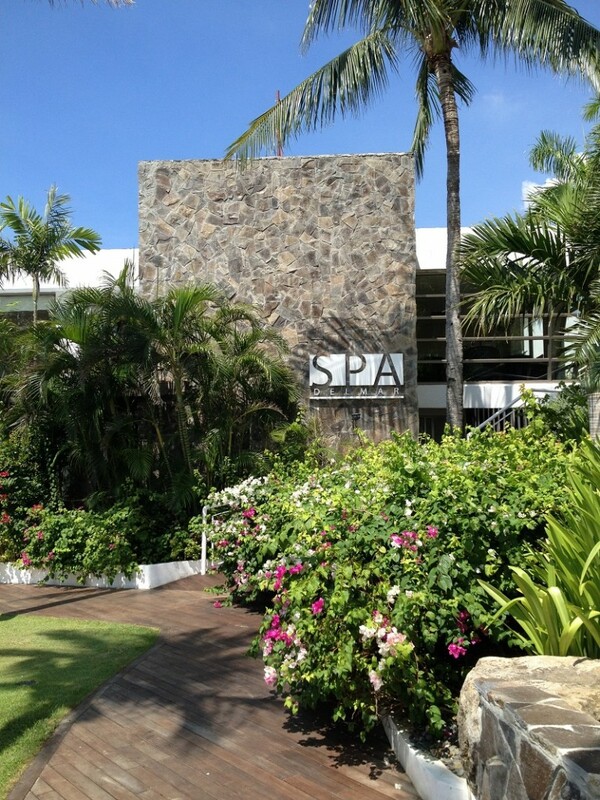 Of all the spas I’ve ever been to, hands down, Spa Delmar was the best ever! 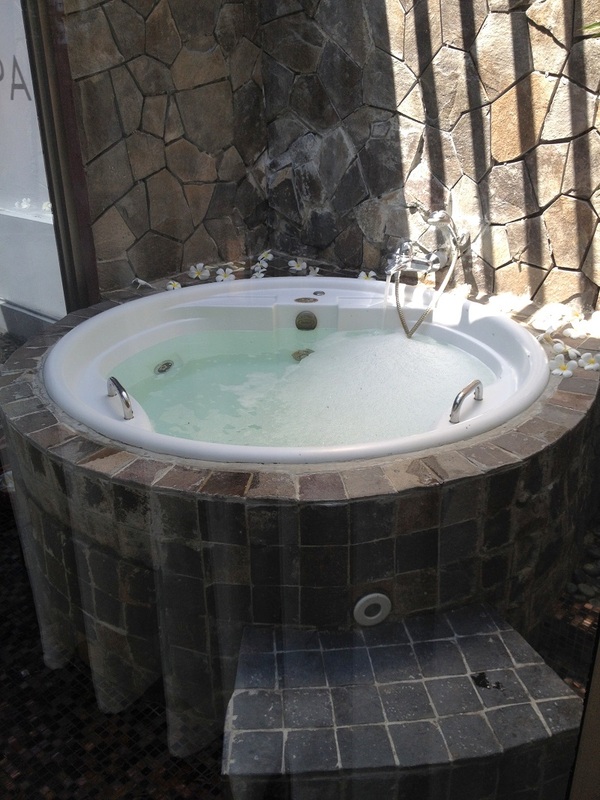 The spa suite was so over-the-top luxurious, and my therapist was skilled and never rushed through my treatments. My family said that next time I visit Cebu we’ll stay at one of the other beautiful resorts on the island. That’s great and all, but I’m setting aside a day to return to Spa Delmar for some top-shelf indulgence. This entry was posted in Vanity and tagged body scrub, Cebu, massage, Movenpick Hotel, Philippines, spa, travel on July 21, 2014 by jenn.